I love driving on wide‐open highways and backroads, interstates and blue highways alike. As long as I’m not stuck behind a slow‐moving tractor or a convoy of semis, I’m at home in the driver’s seat. So last fall I got to thinking about somewhere I could go this fall, and a road trip to Yellowstone was the obvious choice. And what a great choice it turned out to be! 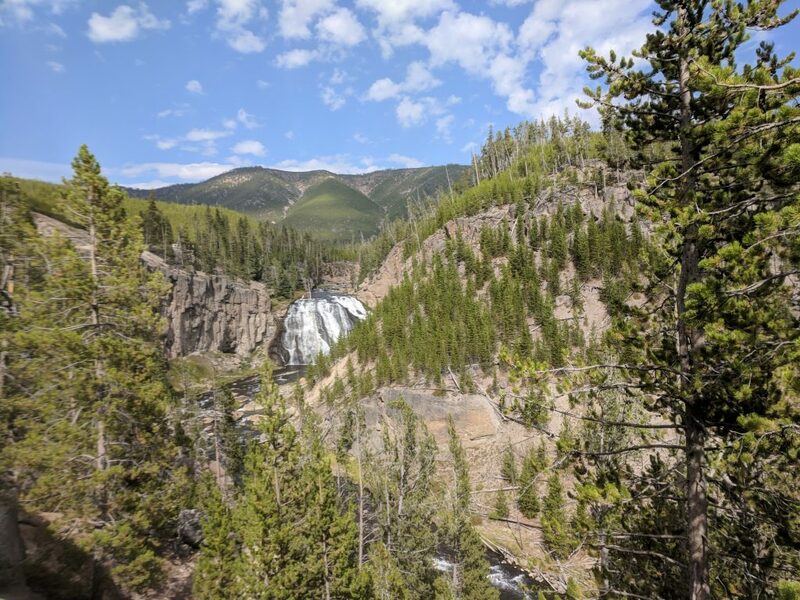 I started out by booking cabins in three different locations in the park: two nights by Old Faithful, two nights by Yellowstone Lake, and two nights by Mammoth Hot Springs. 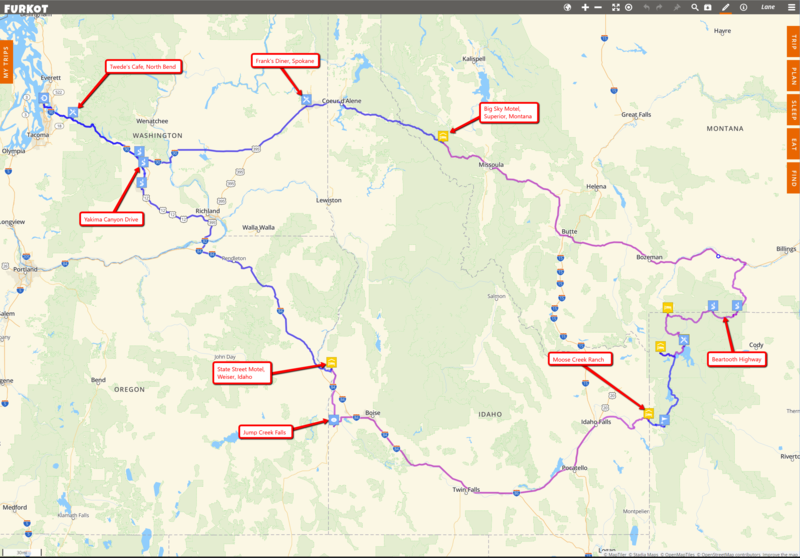 I figured I could easily do the drive with one overnight in each direction, entering the park at West Yellowstone and departing via the north entrance at Gardner, Montana. After talking to some friends and doing some research online, I made some adjustments to my original plan. 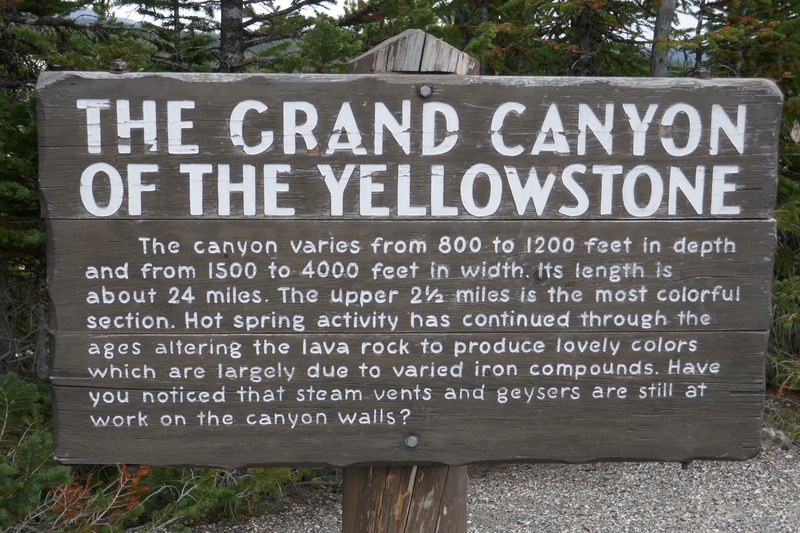 I decided to start by heading toward Grand Teton National Park, so I cut back my stay at Old Faithful to one night. 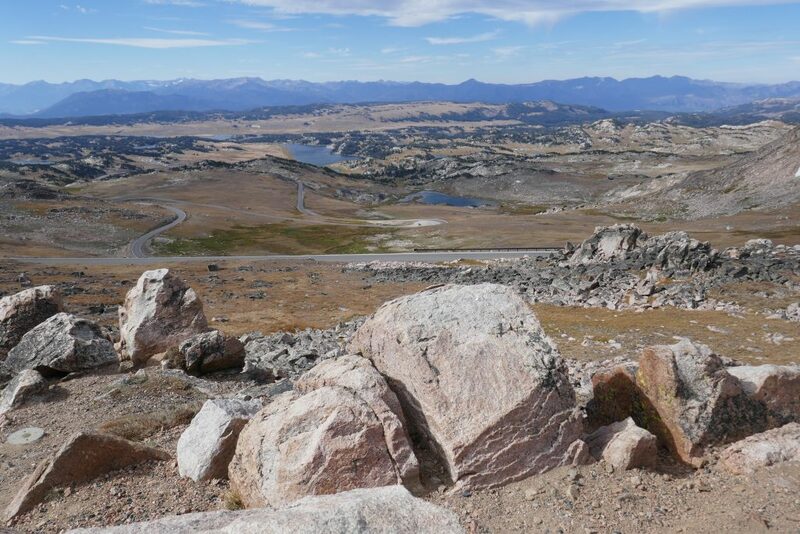 And I really wanted to drive the Beartooth Highway, so I adjusted the route home to allow for that. Using Furkot, an excellent online tool for roadtrip planning, I mapped out the route, decided on where to stop along the way (including some scenic bypasses, roadside attractions, and interesting eateries), and figured out how long each leg would take. About two months before the trip, I asked my friend Margot if she’d like to join me. And she said yes. It was great having company on the long drive and to share many of the experiences, but we also did a nice job of taking time for some separate activities. Screenshot from Furkot.com, showing the road trip plan. I added the annotations. Here’s a rundown of the trip. I’m throwing in some photos, but for the full experience, check out my photo albums. Margot and I are ready to go! 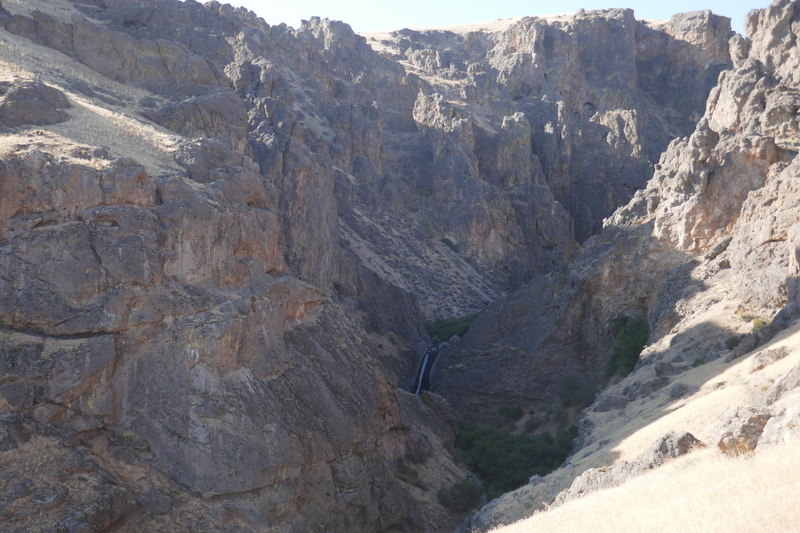 We decided to detour off the Interstate to drive through the Yakima River Canyon, so that meant driving through Ellensburg. While we were there, we decided to check out the campus of Central Washington University, and we stopped to check out the Kittitas County Farmers Market. The campus was attractive, and downtown Ellensburg had some interesting older buildings. But my favorite part was meeting this dude. The Yakima River Canyon Scenic Byway was very pretty. 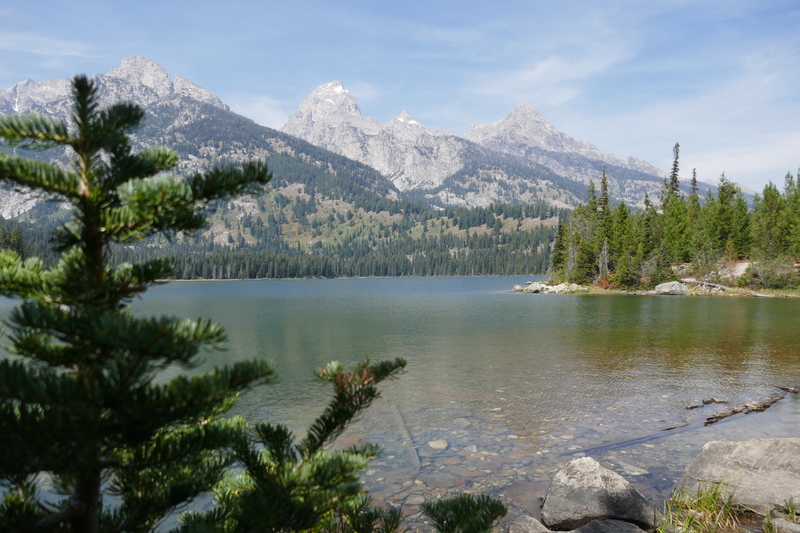 About four hours into our eight‐day road trip, I was wowed, but in retrospect, I have to say it was not even close to a scenic highpoint of the journey. The Teapot Dome, originally built in 1922 as a monument to the Teapot Dome Scandal that shook the Harding administration. 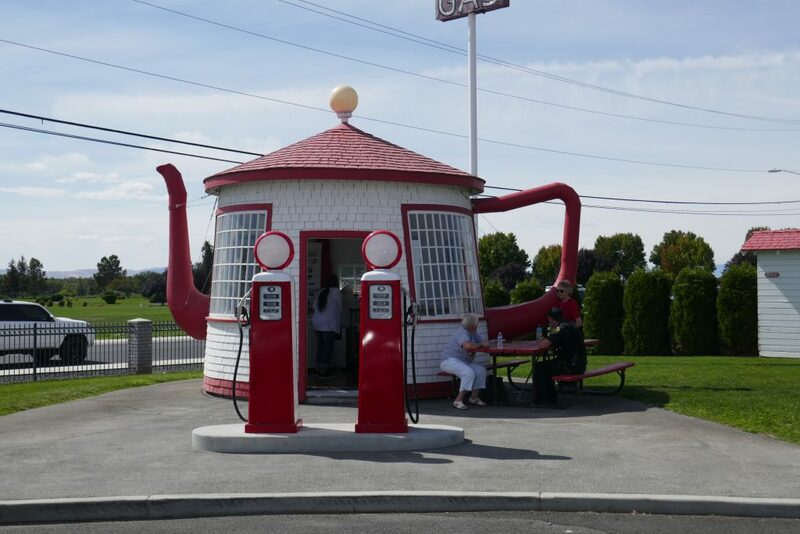 The teapot was hit by a car in 1978, and was rebuilt and then moved several times. It is on the National Register of Historic Places. The rest of our Saturday drive was rather dull. 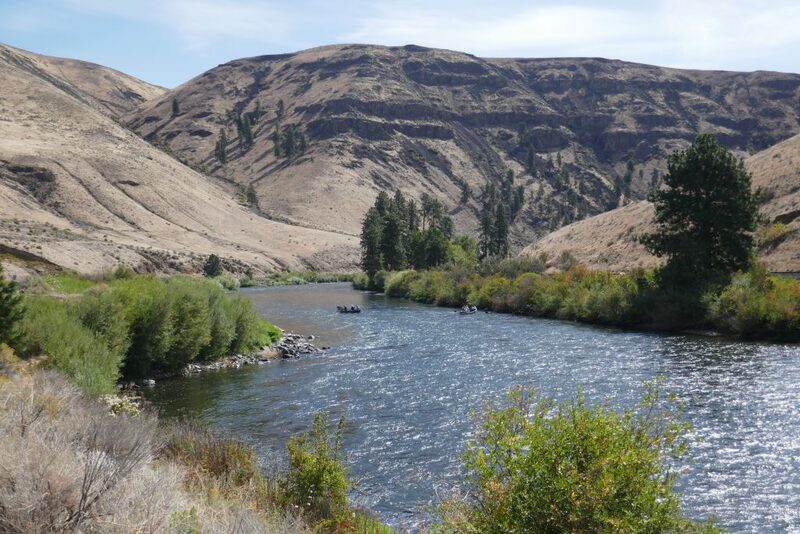 Northeastern Oregon had little to offer in the way of scenery. We ended the day in Weiser, Idaho, where we spent the night at the State Street Motel. There wasn’t much to Weiser. 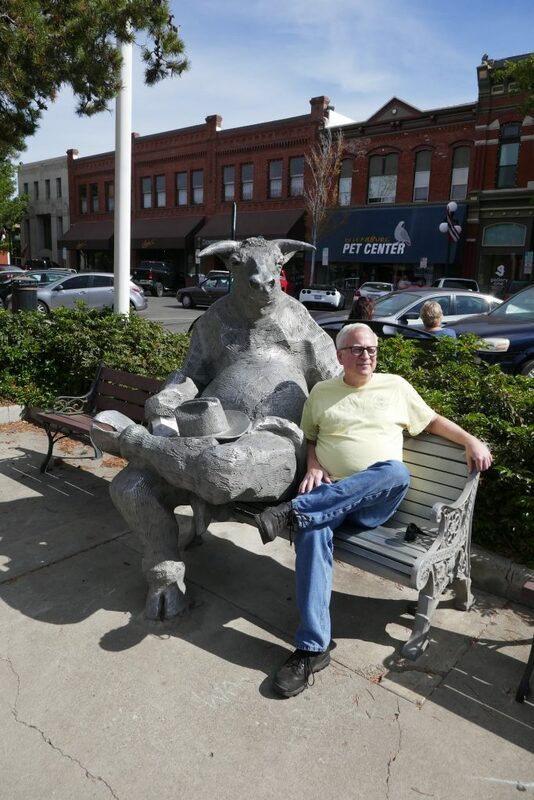 The reason I wanted to stop there was because my friend Gary, who is part of my writing group, is working on his second novel set in Weiser. 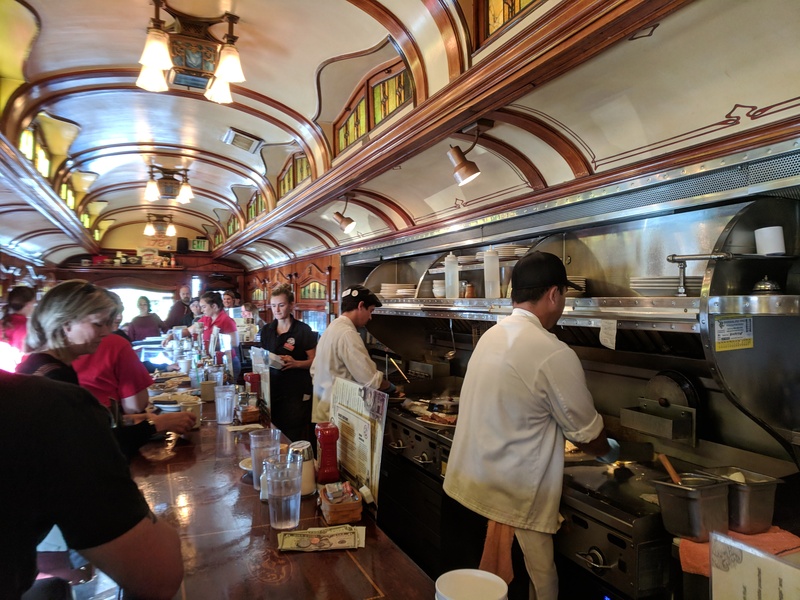 The characters in his novels are always having coffee or breakfast at the Homestead Cafe, so that was where Margot and I got breakfast, and it was good. 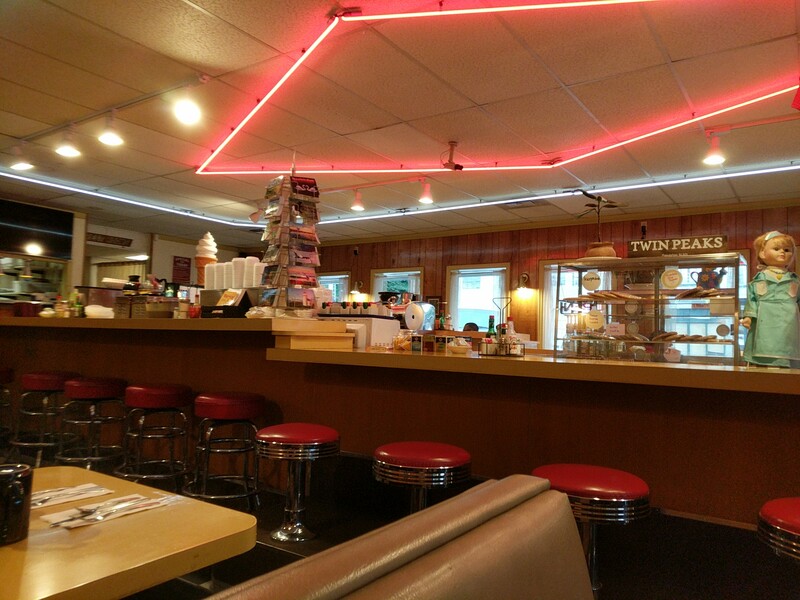 Dinner the night before, at Judy’s Weiser In (with one ‘n’), was also surprisingly okay. 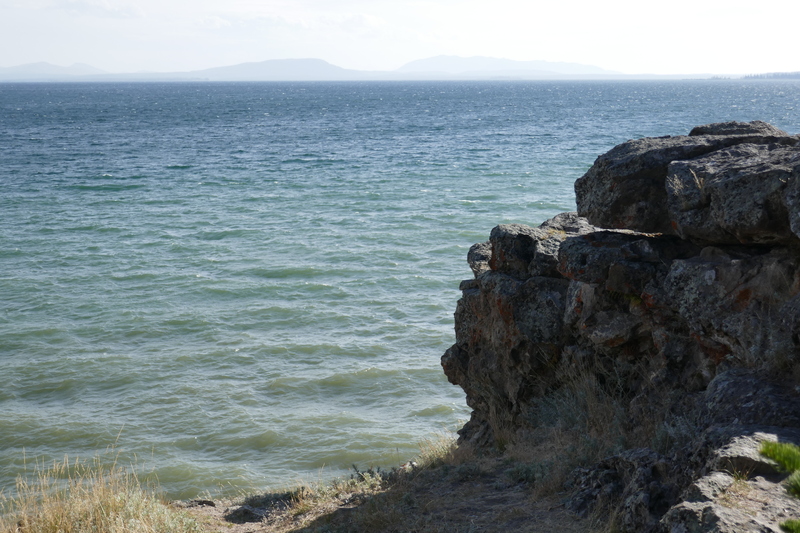 Before we headed east across the wide part of Idaho, we went to a spot a coworker told me about. Jump Creek Falls is a small waterfall, 60 feet high, but it’s in a small canyon and at the foot is a nice swimming hole. 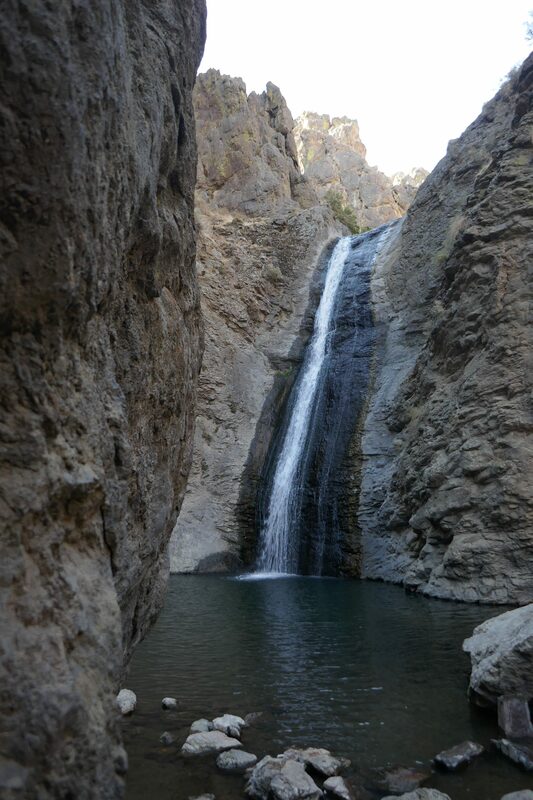 We didn’t swim, but we really enjoyed the scenery, both from above and inside the canyon. 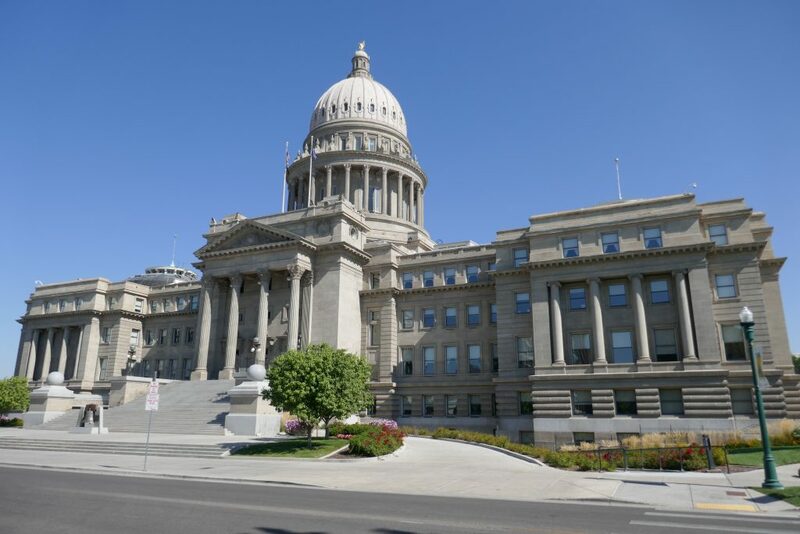 Our drive took us through Boise, and we decided to take a detour to visit the state capitol. The rest of the drive through Idaho was long and not very exciting. We made it to Moose Creek Ranch, where we spent the night less than a mile from the Wyoming border at the foot of Teton Pass. After dinner at the lodge, we got a show from Old Faithful, which you can enjoy while sitting in rocking chairs on the deck. We decided to get up before sunrise and jump in the car and try to get a glimpse of some early risers of the non‐human variety. We were awake at 6:00 and out of the cabin by 6:30. It was still dark. We drove north a ways as the skies lightened. All we saw was a lone bison. 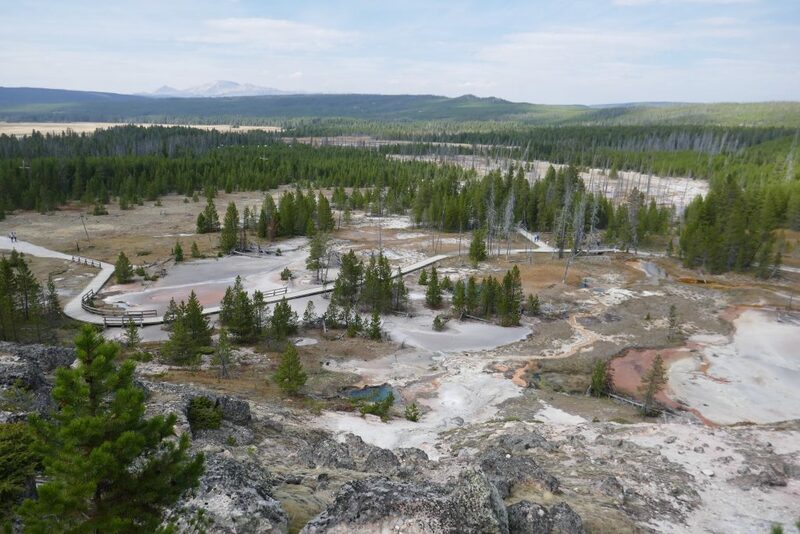 The half‐mile (.8k) Fountain Paint Pots trail takes you through one of the most complex and dynamic hydrothermal areas in Yellowstone. 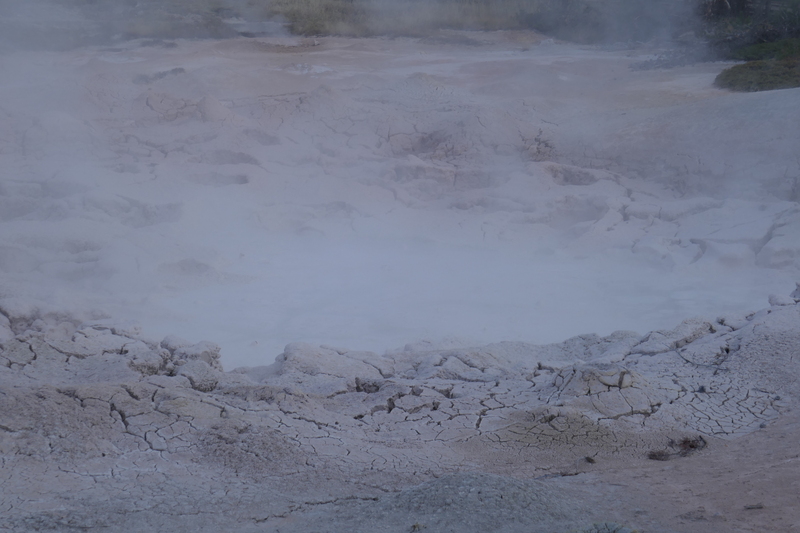 Here you will find geysers, hot springs, fumaroles, and mudpots. The geysers in the Fountain Group exhibit a variety of eruption patters and intervals. In the spring, the mudpots are thin, soupy, and splash a lot. As the year goes on and there is less water, they become thick and gurgly. I had to look up the word “fumarole.” It is a hole in the earth’s crust which emits steam and other gases. Many of them have a strong sulfur smell. According to Wikipedia, there are some four thousand fumaroles in Yellowstone. This was one of the most surprising parts of my visit to the park. I knew about Old Faithful, of course, but I was not aware that there is so much geothermal activity all over Yellowstone. 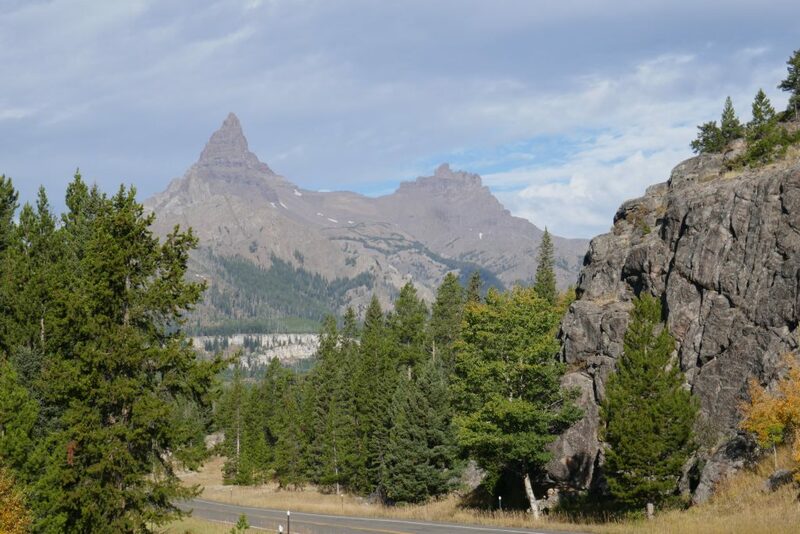 It stands to reason, though: most of the park is within the caldera of an ancient volcanic eruption. 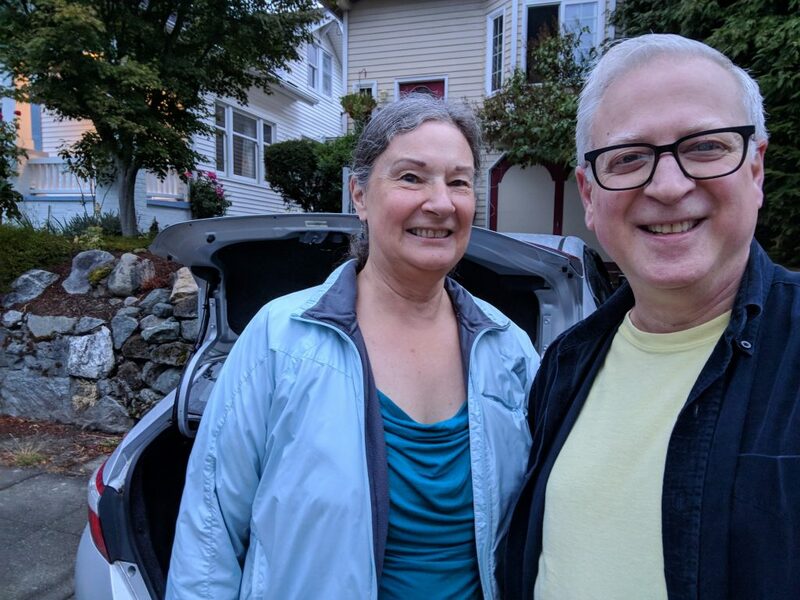 If we’d thought ahead, we would have visited some of the other attractions along the road while we were up early (before the throngs clogged the parking areas and the trails), but we needed coffee and showers and breakfast, so we headed back to our cabin and to the lodge. After we packed up and enjoyed another eruption of Old Faithful, we headed north again on a long drive to Yellowstone Lake. We made lots of stops to check out the sights along the way, and here’s where it really dawned on me: nothing in Yellowstone disappoints. The topography and the scenery are so varied, and every time we stopped, whether for a short walk or a long hike or a scenic overlook, it was fabulous! 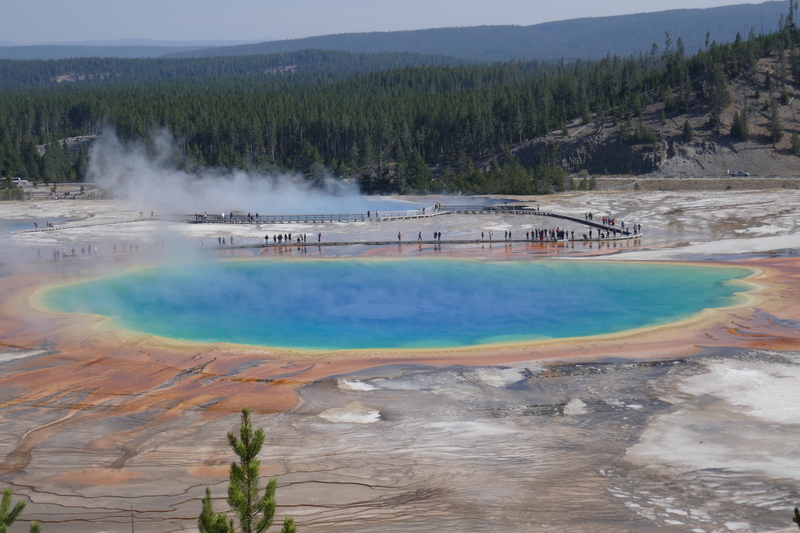 Grand Prismatic Spring, one of the real highlights. We didn’t get to walk the boardwalk because the parking lot was jam‐packed, but I took this hike up to a great viewpoint. This is the largest hot spring in the United States, third largest in the world. 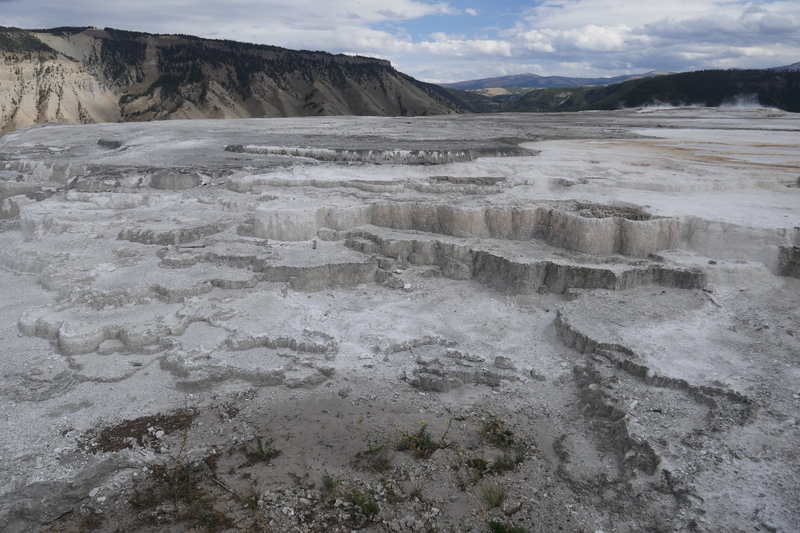 Artist Paint Pots, viewed from the top of the path, where there are more geothermal features not shown here. 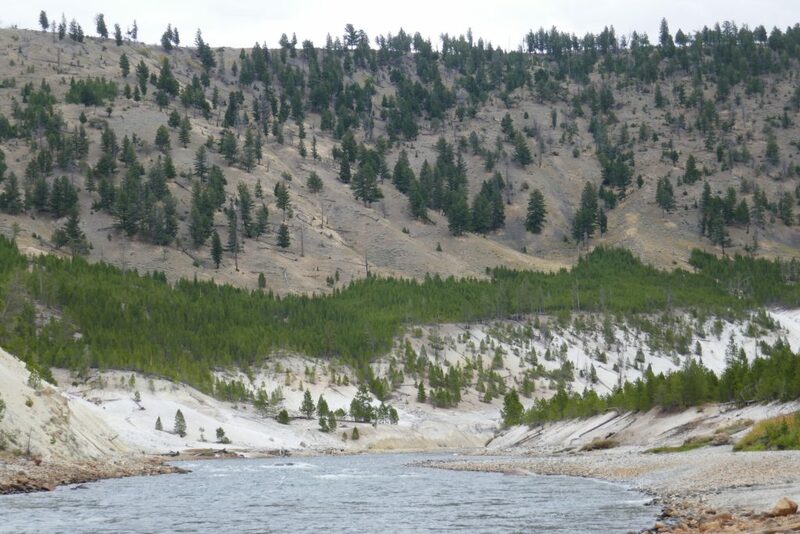 This view of the Yellowstone River is one of my favorites. Before the trip, this is what I imagined as the prototypical Yellowstone landscape. In actuality, not a lot of the park looks like this, and I was thrilled to stand at this spot and enjoy the view for a while. 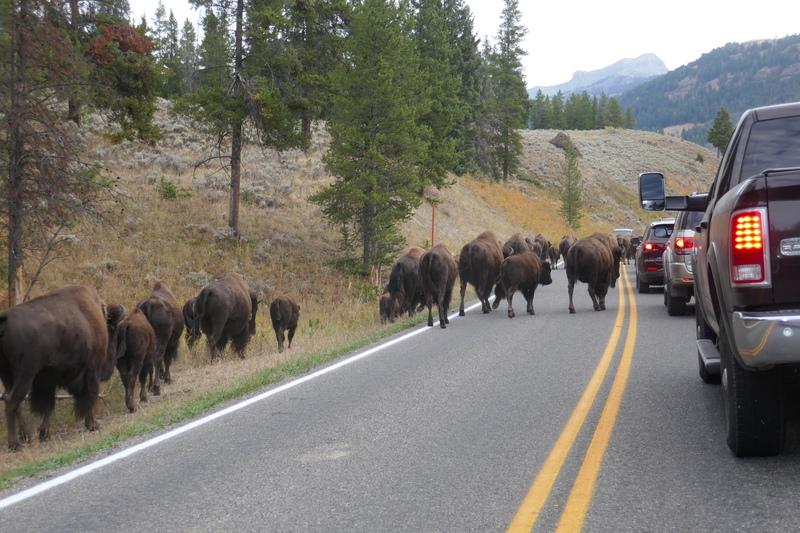 Before we got to Yellowstone Lake, we encountered our first bison traffic jam. But we made it, got checked in to our cabin (much bigger and nicer than the one at Old Faithful), and after dinner at the lodge cafeteria, were happy to go to sleep early after the long day. This was midpoint of our trip, and we were both happy to take a small break from the activities. I bought a WiFi pass with the hope of sitting at the Lake Lodge and doing some blogging, but the WiFi was too slow to upload any pictures, so I just used the day to catch up on email and touch base with folks on social media. It was pleasant to relax at the lodge and enjoy the view of the lake without having anywhere to go. Later in the afternoon we decided to join a ranger‐led hike from Indian Pond to Storm Point. It was enjoyable, though I found the ranger somewhat dull in his explanations of what we were seeing. 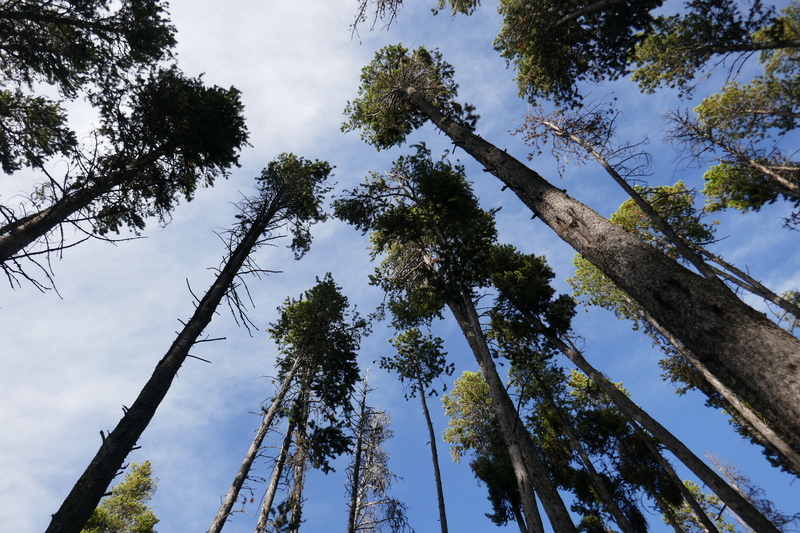 Lodgepole pines make up the vast majority of the forest in Yellowstone. They sway in the wind and are easily knocked over. They also burn, and fires have destroyed a lot of trees over the years in the park, but have also made room for new growth in many areas. That night we had a dinner reservation in the Lake Hotel restaurant. I ate elk. It was a fine meal. 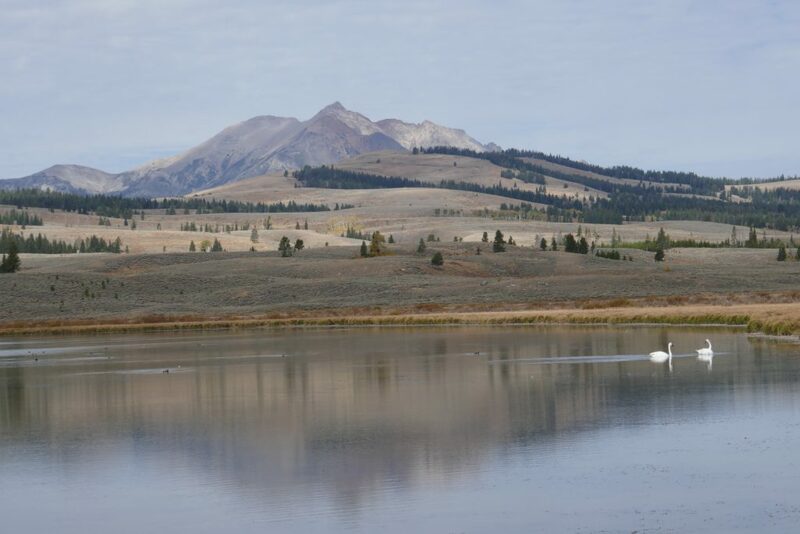 We ate breakfast in Lake Yellowstone Lodge, sitting by the window, and outside we got such a treat. A man in the parking area decided to change his shirt behind his Tesla. The sight of Mr. Tesla’s hairy back is still etched in my memory. 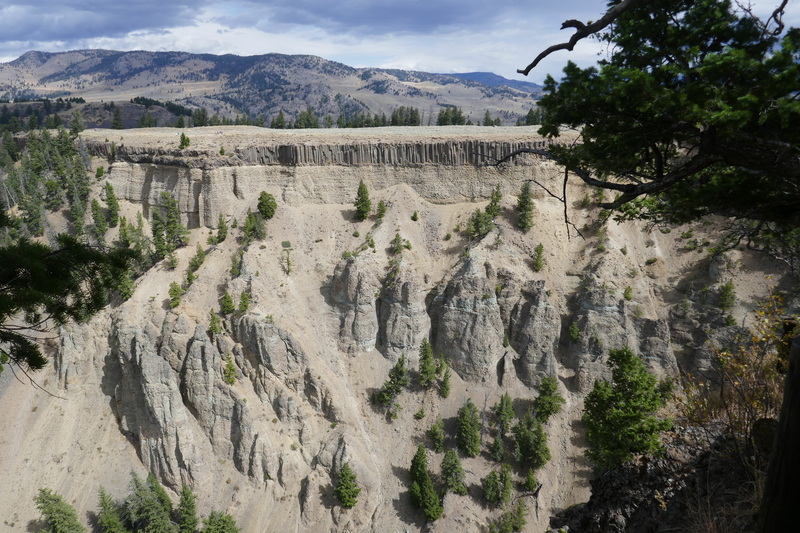 After all we’d seen so far, I would have been hard‐pressed to believe the drive from Yellowstone Lake to Mammoth Hot Springs would be the highlight in terms of scenery. 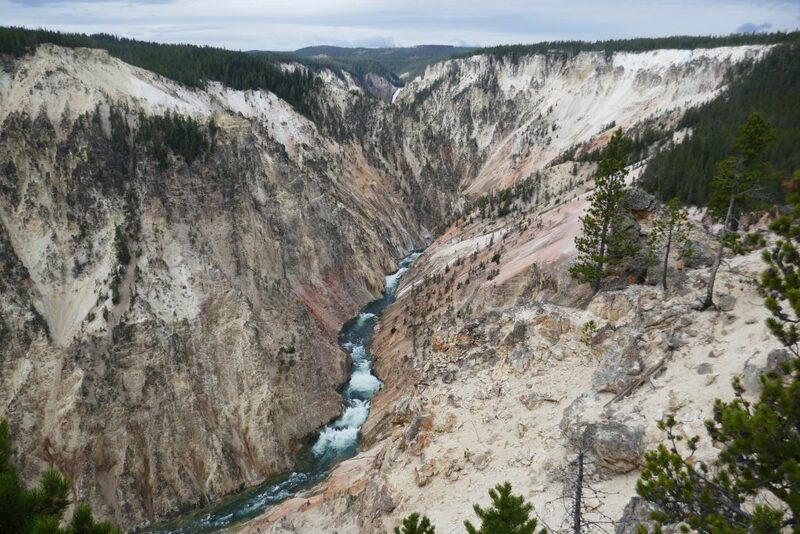 But the area called “The Grand Canyon of the Yellowstone” is without a doubt one of the most beautiful places I’ve seen on this planet. 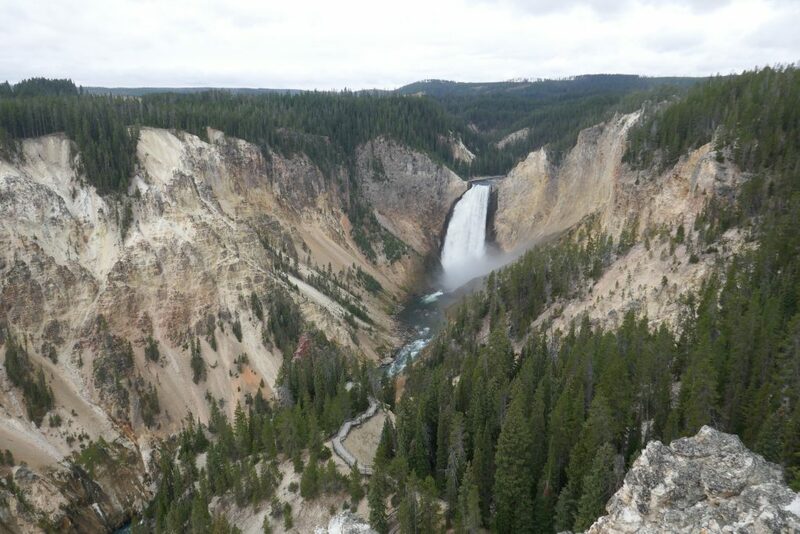 The Lower Falls, seen from Lookout Point. The walkway you can see at the bottom of the photo leads to a viewing platform, which you can just make out between the trees. Going down was pretty easy. Coming back up was a little harder. But the up‐close view of the falls was worth it. The view from Inspiration Point. You can barely see the falls near the top of the photo, as we are a ways downstream. Just one thing interfered with the beauty of the scenery: Mr. Tesla kept appearing at every viewpoint! No longer shirtless, thank goodness, but every sighting was a nauseating reminder of the show we were witness to during breakfast. But we weren’t done with great scenery when we finally continued our drive. All along the road were spectacular things to see. 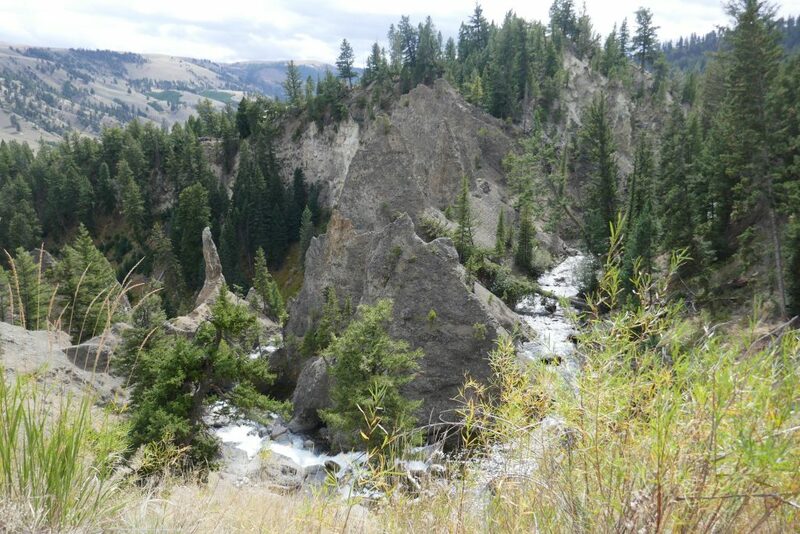 I hiked down to the Yellowstone River from the trailhead that begins at the viewpoint for Tower Fall. 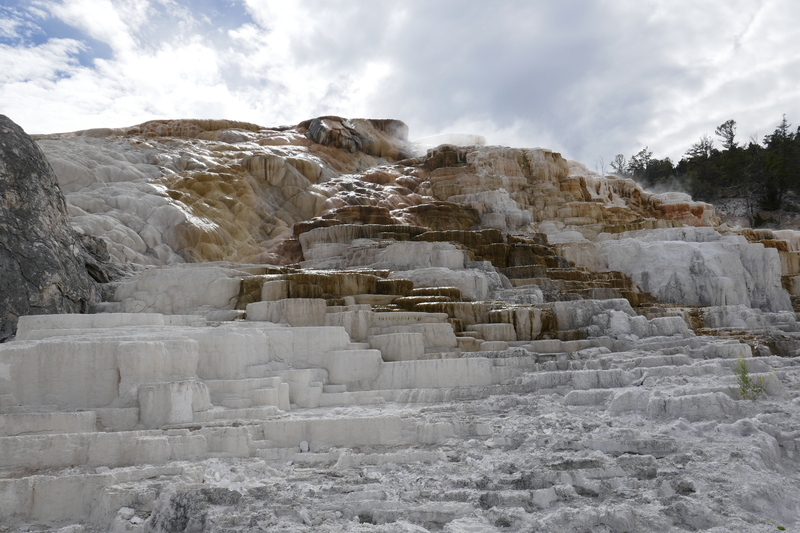 We arrived at Mammoth Hot Springs mid afternoon, checked into our cabin (better than Old Faithful, not as nice as Lake Yellowstone), and then while Margot took a break I went and checked out the hot springs. Unlike the other thermal features at Yellowstone, Mammoth Hot Springs are above ground. 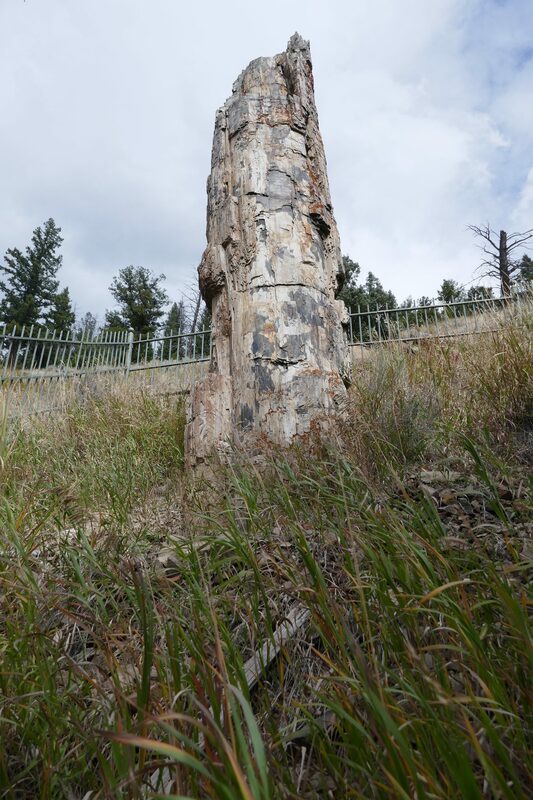 It consists of deposits of calcium carbonate that was dissolved in groundwater and then forced to the surface. I read somewhere that it looks like an inside‐out cave, and I think that describes it well. The other attraction in this area of the park was the aggressive rutting activity of the elk. When I first approached the hot springs, two males and a number of females were gathered on a grassy area alongside the boardwalk, and a ranger was blocking part of the walkway, as it came close to where one of the males was sitting. That night at dinner several elk were congregating just outside the dining room, and our waiter told us that earlier in the day a tourist was attacked, flipped, and gored by a bull elk. 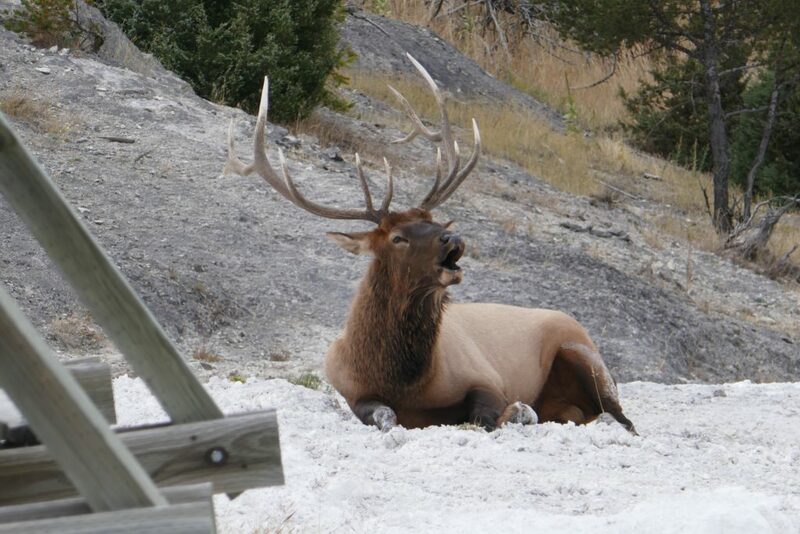 We later saw them near our cabin and all around the Fort Yellowstone area. After breakfast I took a short hike while Margot explored the hot springs. As I was returning, I had my own personal elk encounter. A bull was blocking the trailhead, female nearby, preventing me from getting through. He was clearly agitated, bugling repeatedly and moving listlessly. A ranger shouted instructions to me, telling me to back up and then go around behind a nearby building and wait for the bull to move on. At the same time she was holding back people trying to exit the hot spring boardwalks. Eventually the bull retreated, and the ranger yelled to me to come quickly. I did! 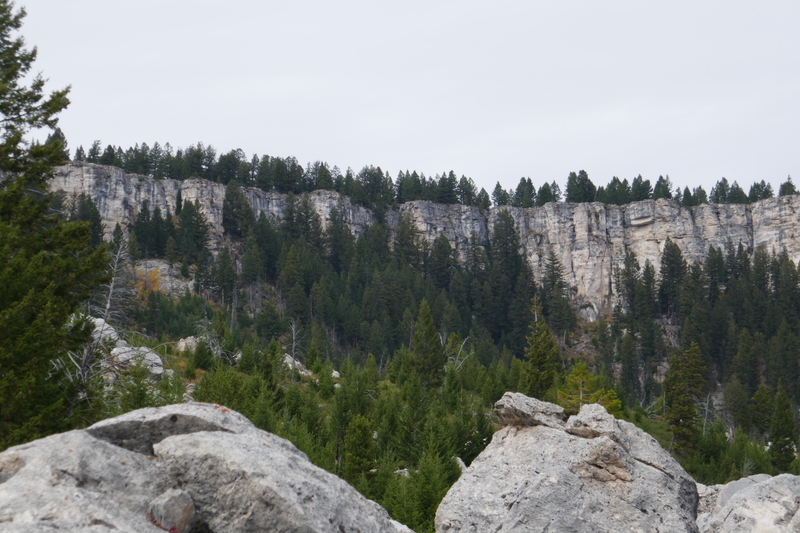 After my elk encounter, I took a drive on my own to explore the area south of Mammoth Hot Springs. And hard as it is to believe, I saw some beautiful scenery along the way. Swan Lake, complete with namesake birds., and the Gallatin Range, Electric Peak in the middle. 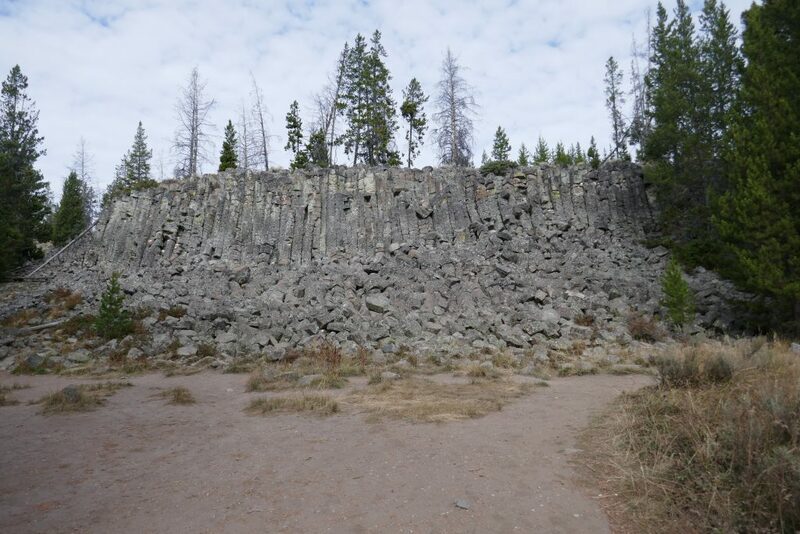 Following my short road trip (it would have been longer, but there was construction further down the road, and signs were warning of possible 30‐minute delays, so I turned around before I got that far), I took a walk around the Fort Yellowstone structures. Then Margot and I took a short drive to check out a few more waterfalls before dinner. After dinner I had a drink at the bar in the hotel, where I met a woman named Claire from Seattle who gave me a recommendation for a dinner stop in Missoula. We got an early start this morning for the first leg of our drive home, as we had a long drive ahead. The shortest route home would be north out of the park and up toward I‐90, but we headed east through the Lamar Valley and out through the northeast entrance at Silver Gate, Montana, so we could drive the Beartooth Highway. We enjoyed a stunning sunrise, and then, as we went through the Lamar Valley, we found ourselves stuck in two big bison traffic jams. The first one was caused by several beasts standing in the road and completely blocking traffic as others crossed back and forth. 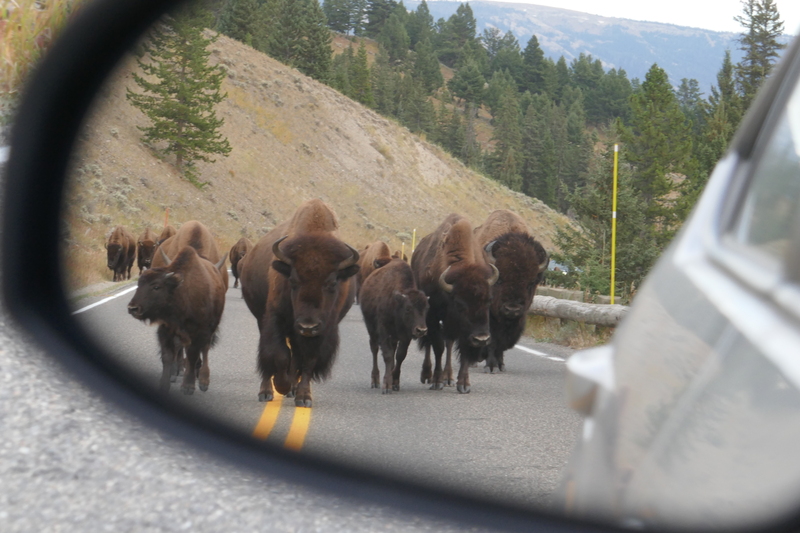 Later, we were actually stuck in bison traffic as they lumbered along at their own pace, behind us, in front of us, and alongside us. Thanks to the bison, it took us two hours to get to Silver Gate, a drive of less than 50 miles. 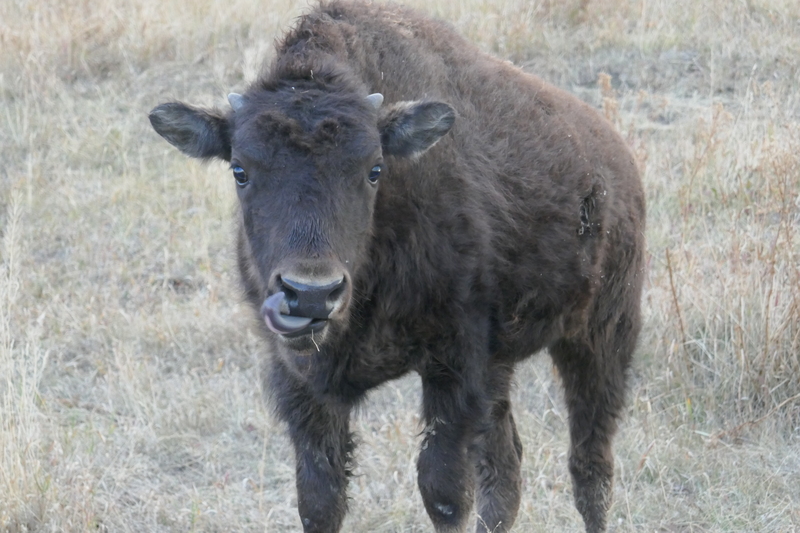 But it was fun and we enjoyed the scenery as well as the bison. 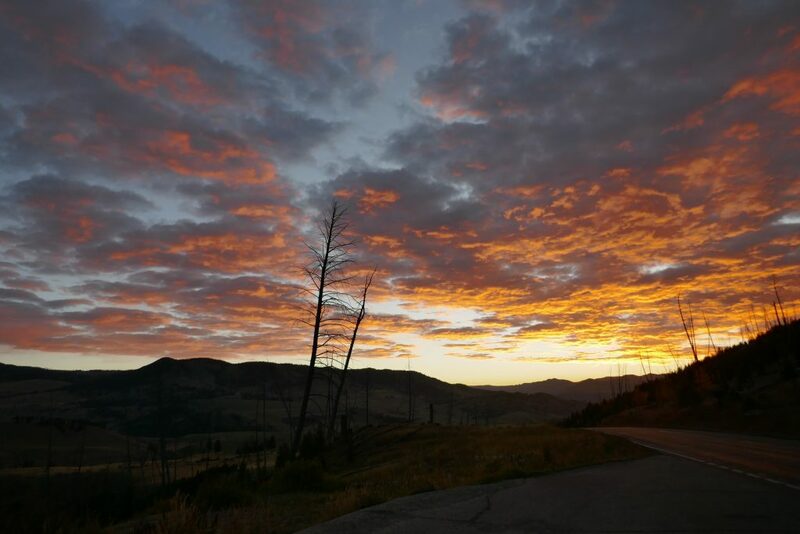 But the best lay ahead on the Beartooth Highway. So said Charles Kuralt about the 68‐mile drive. Though it starts and ends in Montana (from Silver Gate to Red Lodge), most of it is in Wyoming. 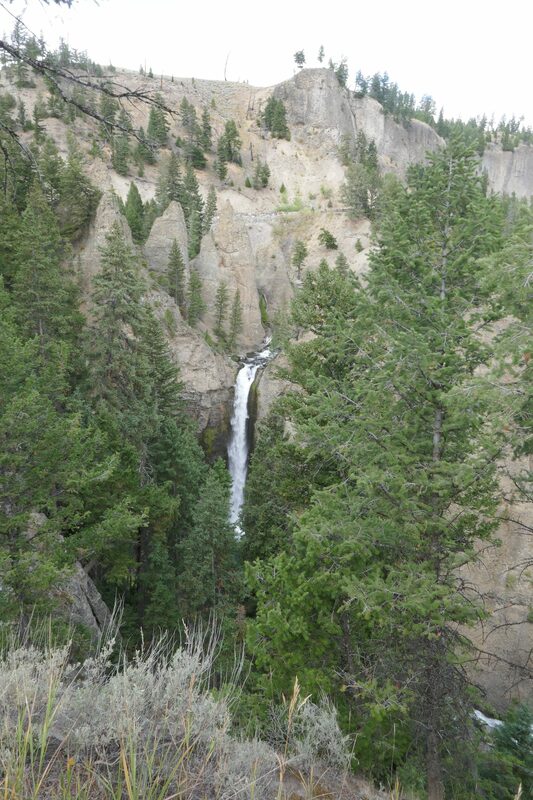 And like most everything in Yellowstone, it did not disappoint. 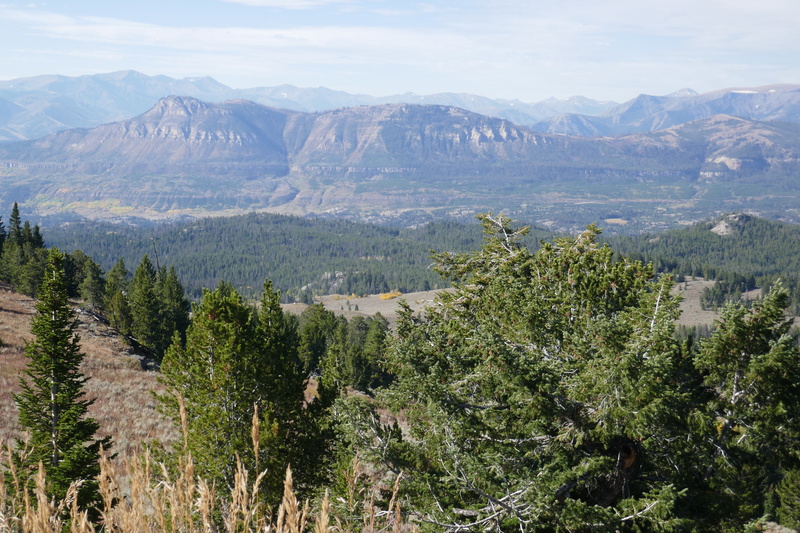 It started by meandering through a gorgeous valley, and then climbed above treeline, close to 11,000 feet, via many switchbacks and fun white‐knuckle driving. 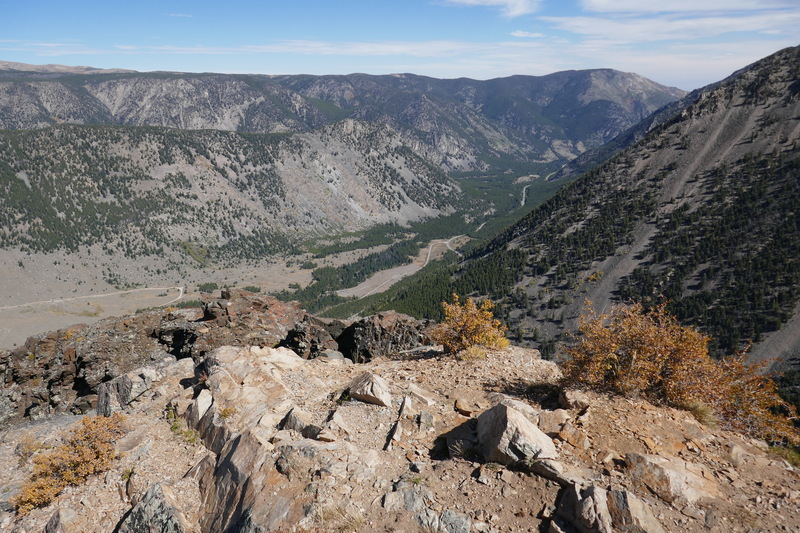 Before descending, we stopped at Rock Creek Vista, where we could see all the switchbacks that lay ahead. We made it to Red Lodge in time for lunch, and then drove on to Missoula where we took Claire’s suggestion and had dinner at the Top Hat. From there, it was just another hour to Superior, where we spent the night at the Big Sky Motel. 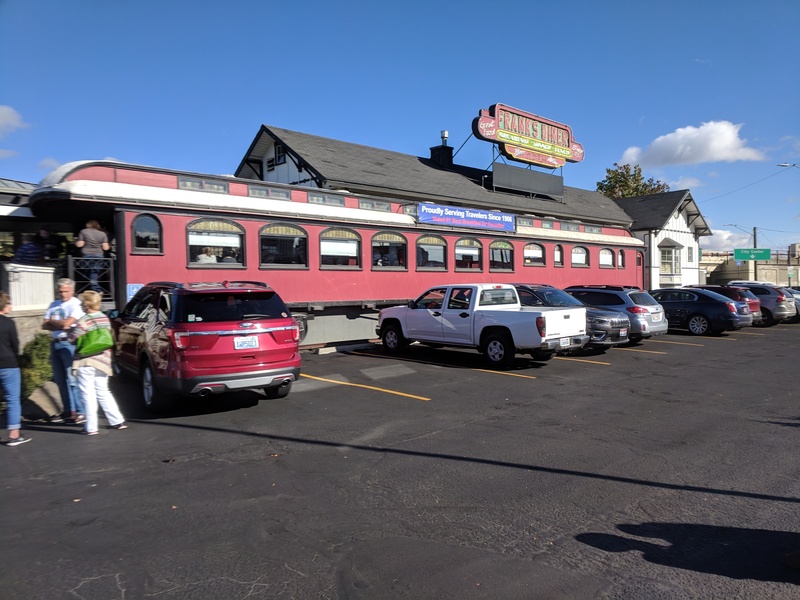 We stopped for breakfast at Frank’s Diner in Spokane. The photos I included in this blog post are just to whet your appetite. Please check out all the pictures in my photo albums!